Suruga-cho (駿河町) in Nihonbashi, Tokyo. The three story building on the left is the Mitsui-gumi Exchange Bank (為替バンク三井組), designed by Kisuke Shimizu II (二代清水喜助, 1815-1881), and completed in 1874 (Meiji 7). Its unusual design mixed Japanese and Western styles which made it stand out from its surroundings. It became one of Japan’s best known symbols of imported Western civilization. 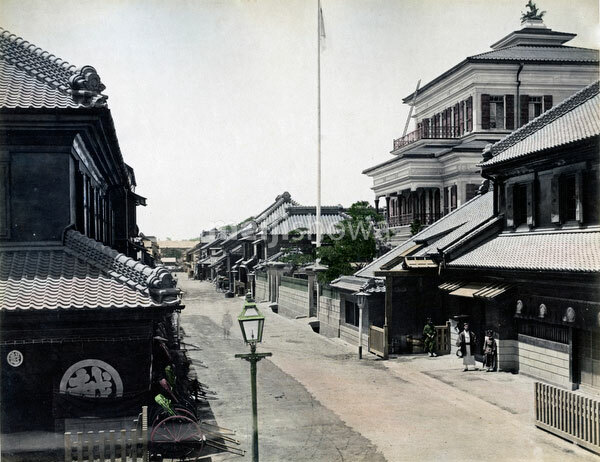 Shimizu worked with American architect Richard P. Bridgens (リチャード・ブリジェンス, 1819 -1891) and would design important Meiji buildings like Mitsui House and Tsukiji Seiyoken Hotel. Shimizu Corporation still exists and now is a major construction company operating internationally. Suruga-cho is also the location of Mitsui Echigoya (三井越後屋), the forerunner of Nihonbashi Mitsukoshi Department Store (日本橋三越本店). This spot was famous for its view on Edo Castle and Mount Fuji. Photographed around 1877 (Meiji 10).